The new Spring Mountains Visitor Gateway is located in an area of 128-acre, which is part of the Humboldt-Toiyabe National Forest. 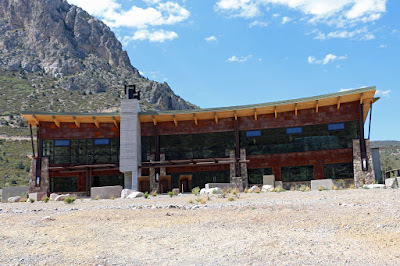 Spring Mountains Visitor Gateway is open after almost 3 years of construction. Because Mt. Charleston is considered the sacred birthplace of the Paiute Tribe, they were part of the construction and design. It is beautiful to see the touch of the seven nations of Nuwuvi - Southern Paiute - throughout the design and surroundings, beautiful iron arts, tiles mandalas, animal sculpted. The Visitor Gateway is sculpted to create five plateaus, two amphitheaters, one sightseeing with benches, one picnic area and one huge space for hiking groups gatherings at the main entrance of the loop trails. Sightseers can stand in a circle of 360-degree view from the top of Cathedral Rock to the Visitors Gateway. Inside the Visitor Gateway there is a gift shop, an interpretive gallery which opens a large field area for group gatherings, and orientation loop trails. Instead of a traditional heater or air conditioner, the building has a system of heat-exchanging coils that works much as the coils in a refrigerator. Only in this case, roughly 10,000 feet of coils are buried in the ground next to the building and extend inside. A computer automatically opens and closes windows near the ceiling to further regulate internal temperature and air quality. The building is so sophisticated it needs its own weather station. The shelves in the gift shop and paneling on the information desk are made from old-growth redwood salvaged from old campground benches and picnic tables. A few steps from the visitor center, a twisted propeller mounted to a rock marks the entrance to a new national memorial dedicated to the Silent Heroes of the Cold War. Harris said the memorial marks the culmination of a 16-year campaign led by Las Vegas resident Steve Ririe, who helped lift the shroud of secrecy from the 1955 airplane crash on Mount Charleston that killed 14 men flying to Area 51 during development of the U-2 spy plane. At the property’s geographic center is the Seven Stones Plaza, a tribute to the seven Southern Paiute Indian tribes known collectively as the Nuwuvi. As the name suggests, the plaza features seven boulders — one for each of the tribes — arrayed around a central stone marked with a hand print representing Ocean Woman, the Nuwuvi’s creator. There are great loop hiking trails surrounding by an unique ecosystem as the rest of the region. Many of its plants and animals, including one species of chipmunk, are found nowhere else on earth. I-515,making a total of fifteen miles from the Strip. On the spaghetti bow, keep left towards Reno. At that point, head west along Hwy-157, Kyle Canyon Road, which for its first ten miles continues to cross a flat desert. Shortly after, the highway, enters Kyle Canyon Rd. Kyle Canyon Road to a dead end shortly after Cathedral Rock. Looping around the parking lot of Mount Charleston Lodge, Charleston Peak - 11,918-ft - is the higher elevation and usually remain covered by snow between mid-October and mid-May each year. There are 52 miles total of hiking trails in Mount Charleston. If you're a beginner hiker, the popular Mary Jane Falls trail has a seasonal waterfall and even a cave. This kid-friendly, two-mile trail is only an hour long. Fletcher Canyon is another easy hike, featuring walls up to 100 feet. Big Falls and Cathedral Rock are great half-day hikes. Big Falls has a seasonal 100-foot waterfall and Cathedral Rock has impressive views. Set below the highway on the left, seventeen miles up from US-95 and facing a towering rocky outcrop, the Mount Charleston Lodge is the best accommodation option in the mountains. Mount Charleston Lodge is located in Kyle Canyon at more than 7,000 feet. With 24 log cabins, the lodge provides comfort and comes with a spacious outdoor deck and a fireplace. The lounge resembles an old-fashioned national park lodge, with lots of wooden furnishings, a high-vaulted ceiling and an open fireplace. The restaurant at the lodge is a favorite spot offering lunch specials and pricier steak, chicken, and seafood dinners. There is also also a cozy pub style bar. It is usually packed with day-trippers and it is difficult to park close to the lodge. The terrace surrounding the restaurant has many hummingbirds feeders and a fabulous views to the canyon. Outside the restaurant, next to the entrance you can buy beautiful native American jewelry.